Though I intend not to make this blog political, it’s more and more clear to me that I cannot exclude my social and political views from this forum. If I am to be an authentic writer, I must disclose certain values and beliefs that I hold dear. My personal and professional missions are to maximize open communication, mutual understanding, shared vision, and collaboration for common good (basically world peace) between all people. It will take my whole life to find and try different paths to that goal. Today I tried a new one for me. It felt powerful, and I’ll reflect for a while on the experience. Below are my initial impressions. 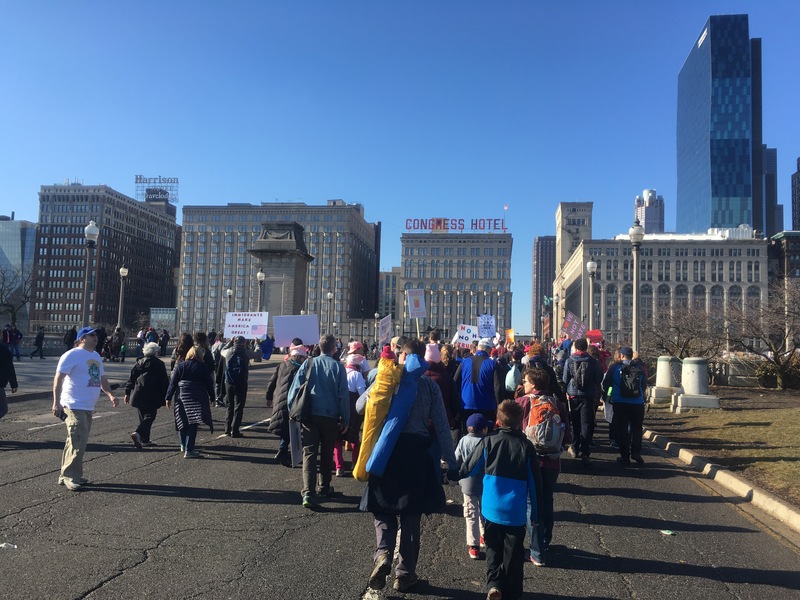 I marched with an estimated 150,000 people in Chicago today, a sister event of the Women’s March on Washington. The energy was positive, strong, and welcoming. It’s not every day that we get to participate personally in an actual, physical expression of a movement. I’m so glad we went. I hope this day can be remembered in history like Woodstock–gatherings of people in peace, more to express what we are for than what we are against. Because we marched today FOR inclusion, solidarity, generosity, and the dream of a peaceful life for everybody. Acts of violence, intolerance, hatred, or contempt by any of us marchers, regardless of the circumstances, would undermine the message and wreck the credibility of the movement. …by a friend of a friend. It’s okay to lament the darkness. Grief is normal and healthy. But then go get a candle and light it. Then go about lighting other people’s candles with yours. The best part is, the light just multiplies. Your light shines no less brightly for giving some away. And pretty soon darkness gives way to all of our light. Things are feeling a bit dark again… Reminds me of October, when I got emotionally hijacked by current events and found myself anxious and angry, but wouldn’t admit it for a while. On the eve of a new presidential administration taking office, tensions run high once again and I’m challenged to avoid a similar decent into despair. To my friends who have expressed, “get over it,” and “stop whining,” I respectfully request that you try to empathize with those of us who feel despondent. Nothing will improve if we keep ridiculing and belittling one another. If you experienced this from ‘us’ before the election, remember how it felt. Rise above our worst collective behavior and help us overcome our fears and disappointment by showing us that we really do share more love and connection than we might think. Unity and true indivisibility require all of us to pitch in and reach out. I hope that by one year from now, we can all look back and feel proud of the connections and relationships we strengthened, from left to right and otherwise. What a crazy year… All bets are off, no one can possibly predict what will happen now—so much anxious uncertainty surrounds us all over the place! …And yet I feel hopeful and optimistic. This is the time for our best selves to truly shine—the perfect opportunity to call on everything we have trained for—all of the grit, the kindness, the curiosity, the openness, the brave vulnerability~~~all of it, in service of connection, mutual understanding, and forging a way forward to a BRIGHTER future! Because we now know, again, in humanity’s history, what darkness looks and feels like. We can’t stay here, and we won’t—we can each shine a light. And if we stand close, the light amplifies exponentially. So thanks for being a fellow light shiner, (my friend)! May we keep our connections with each other and our other fellows ever close—we need us—the world needs us—now more than ever!! Keep it lit, my friend. …Hope this card finds you well and HOPEFUL. Because I have decided that that is what we all need to practice more now than ever—HOPE. 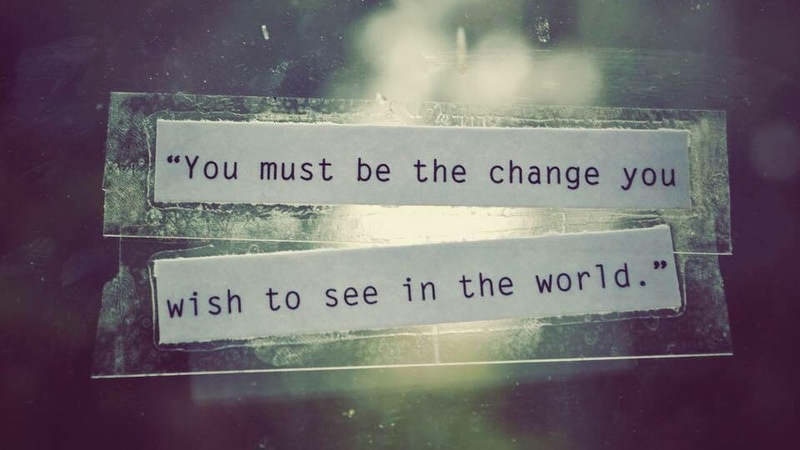 Those of us who strive for conscious living and more connection than the superficial have TRAINED for this moment in history—to PRACTICE OUT LOUD and IN FRONT of everybody—to lead by example and make the difference we were born to make! We don’t need to do big things—we just need to keep the faith and stay the course! ’Small things with great love,’ I think Mother Theresa said? Please know I am here to support your efforts, as I know you are for mine! Let’s get together and hold each other up again soon! …Because I know so many people whose core values represent the BEST of our shared humanity—equality, compassion, community, connection, love, and forgiveness. The world needs these qualities and practices by us more now than ever—so if we hold each other up, we’ll all be able to do the work better—TOGETHER!! So here’s to long friendships and deep love! Peace to all of you, dear friends. Let us manifest our best every day. This recent article from Wired got me thinking (again), there are so many layers and moving parts to healthcare reform, that no one player stands to lose all or benefit all from any changes. And yet so much of what we read and hear has an, ‘it’s so simple, they just don’t care about you, but I do’ tone. The piece describes why insurance companies, who may have advocated most fervently against implementing ACA regulations, actually have a stake in maintaining its current status. Nothing in our healthcare system is black or white, all good or all bad. So when I see politicians (and friends) speaking and writing in oversimplified sound bites, and vilifying a whole group (all liberals, all Republicans) over one aspect of their point of view, it really frustrates me. That is exactly the opposite of productive dialogue. It just makes people stop listening, because they don’t feel heard or understood. So they have no incentive to hear or understand you. Many use the car insurance analogy to explain health insurance. It’s not exactly parallel, but it makes some sense. The law requires every car to be insured. (Drivers of) cars that don’t violate traffic law get lower premiums, the longer they stay ‘safe.’ The more traffic law violations, the higher the risk, the higher the premium. I have an actuary friend, who works for a health insurance company, who advocates, in part, for higher premiums for those who ‘use’ the healthcare system more—like the higher risk cars (drivers). I understand this logic. But this idea of making older and sicker people, and women pay more, just because they ‘use’ the system more (and thus financially speaking cost more), does not sit well with me. People are not cars. Not everybody maintains their cars well. But poorly maintained cars do not necessarily lead to increased accidents and traffic law violations. Poorly maintained health often leads to a human body’s multi-car highway pile-up equivalents. My friend advocates for insurance coverage for catastrophic care (also aligned with the car insurance model), but not necessarily for preventive or primary care. There are different ways of ‘using’ the system. If you get preventive care, like recommended cancer screening and annual exams, it may cost more at the time. If you seek help for your back pain early, from your PCP, chiropractor, and physical therapy, that costs money. But if these early interventions prevent future, more catastrophic and costly outcomes, should we really penalize those who make them? Illness and infirmity come with age. So, often, do fixed incomes. Is it right to make our elderly pay more for their care? According to one study (Banarto, McClellan, Kagy and Garber, 2004), 30% of all Medicare expenditures are attributed to the 5% of beneficiaries that die each year, with 1/3 of that cost occurring in the last month of life. I know there are other studies out there that say slightly different things, but the reality is simple: we spend an incredible amount of money on that last year and month. Dr. Susan Dale Block, Chair and Director of Psychosocial Oncology and Palliative Care at the Dana Farber Cancer Institute and Brigham and Women’s Health Care, recently shared some data with her colleagues. In the Archives of Internal Medicine, a study asked if a better quality of death takes place when per capital cost rise. In lay terms … the study found that the less money spent in this time period, the better the death experience is for the patient. Cost, longevity, quality of life, quality of care, value, perceptions, public health—these and other aspects of health and medicine are all inextricably enmeshed, though definitely not integrated. Any decisions about one must be made in the context of all the others, carefully, transparently, and honestly. Whenever we hear, ‘if we just do this, everything will be better,’ red flags should fly. My point here is that nothing is as simple as we’d like. It’s so much easier to blame those who disagree with us for being stubborn, selfish, or evil, than to cope with the discomfort that our system is deeply flawed, there are no easy answers, and our fundamental philosophical differences make it that much harder to agree on the best way forward. And yet, this is what we are called to do. It’s up to each and every one of us to change our language. Each of us has, I believe, the opportunity and the responsibility to create an environment in which open, respectful discussion and debate are the norm, rather than echo chambers and verbal warring. I am only one person. I have no designated leadership titles or widely visible platform. But my words have power. So do yours. Please use them wisely. 26 letters, 26 blogs, starting April 1!